Wilbur F. Holtman, 89, of Golden passed away on Thursday, December 14, 2017 in the Golden Good Shepherd Home in Golden. Wilbur was born on September 3, 1928 in Basco. He was the son of the late Frank and Anna (Osterman) Holtman. He married Geraldine L. Leerhoff January 15, 1950 in Clayton. Geraldine passed away on January 12, 2017. 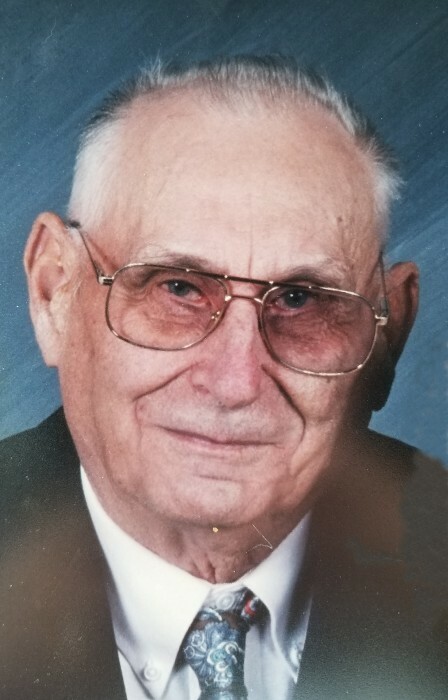 Wilbur was the owner of the Golden Lumber Yard, a member of Trinity Lutheran Church and the Golden Lions Club. Suriviving are; three children, David A. (Theresa) Holtman of Golden, Stanley D. Holtman of Carmel, IN., Amy L. (Trent) Johnsey of Westfield, IN., seven grandchildren, Derek (Ann) Holtman, Brent (Tracy) Holtman, Trish (John) Wietholder, Brittany (Aaron) Gufler and Anna, Brady and Zach Johnsey; eight great-grandchildren, Mackenzie, Morgan, Sydney, Declan and Jordyn Holtman, Lucas and Ellie Wietholder and Emmerson Gufler. He was preceded in death by one sister, Arlene Reuschel. Services will be 2:00 P.M on Saturday, December 16, 2017 in the Hunter Funeral Home in Golden with Reverend Brad Eidson officiaiting. Interment will be in Golden Memorial Gardens in Golden. Visitation will be from 1:00 P.M. until the time of services on Saturday in the Hunter Funeral Home in Golden. Memorial contributions have been suggested to the Trinity Lutheran Church or the Golden Good Shepherd Home. You are invited to share memories of Wilbur and leave condolences at www.hunterfuneralhomes.com.